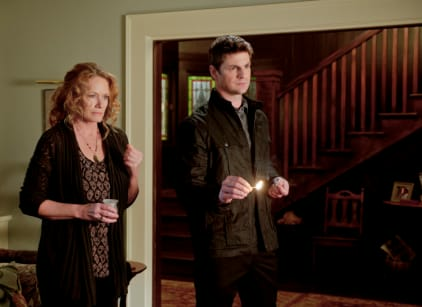 We learn the identity of the other Blackwell child on this episode of The Secret Circle. The circle scours the city for all of the elders crystals. Jane comes home from the clinic. Grant takes Diana on a romantic date. We meet Jake's grandfather, who says the circle will be the death of them all. Charles and Jane arrange to kill John. Grandpa Royce tells Jake, Cassie and Faye about the history of the witches and John's plan to corrupt the circle from within. Callum steals the map to the mine where Grandpa Royce hides his crystal. Grant wants the truth from Diana, but she cannot give it to him. The other Blackwell child is Diana.